The following are two sequences of postures which flow with the breath. Traditionally they are practiced at the beginning of the Ashtanga practice. We suggest you practice these daily to build your strength, flexibility and endurance. Learning step-by-step so that you can adapt the sun salutations to your particular needs is an important tool when either learning them or when dealing with any kind of limitation – sore back, tight hamstrings, weak shoulders or arms. Therefore, in this video we teach you how to go through the salutations in way to progressively develop the strength, flexibility and endurance needed while also moving in a flowing manner. Once completing the sun salutations, you can begin the Ashtanga standing sequence. In this video we skip some of the poses and offer modifications, to focus on giving the person new to the practice the bases of Ashtanga in a logical and flowing way. Also, this is a nice way for those dealing with a time constraint or other limitations to get a small practice in when a full practice isn’t going to happen that day. This is important to avoid developing an ‘all or nothing’ mentality. When you cannot do everything there is always something that can be practiced to keep the prana flowing through the body and to calm the mind to prepare us for the day to come. In this video Linda talks you through a one-hour beginner’s Ashtanga class. If you are a complete beginner this is a great class to follow to build a strong foundation for your future in Ashtanga. If you are more experienced then it is a great class to bring beginner’s mind to your practice. If you are a teacher then it is interesting to learn some ways to introduce the practice to people for the first time. Before doing this sequence do the Sun Salutations A & B. After finishing the standing positions you can do sitting and finishing asanas as you’ve been instructed by a qualified teacher. This is a video that you can easily follow from home where Linda guides you through the Primary Series until Marichyasana. This is a guided class that you can practice with that goes up until Supta Padangusthasa then straight to back bending and the finishing sequence. This is a good video for one to follow along with to go through the full primary series. It’s also interesting to watch as a teacher to see the group practicing together while Gerald and Linda give hands-on adjustments. This is a short invigorating, dynamic sequence of flowing postures which are based on the principles of Ashtanga; drawing inspiration from primary, secondary and advanced series and beyond. Before doing this sequence you can do Sun Salutations A. Here are some little tips to build up the strength to be able to do the jumping back and through between the sitting positions. When we have something to work on, it is motivating and slowly, slowly over time we begin to see the improvements. You can do these every day! This is a moderate level class that starts slowly, working up to some more dynamic poses that are designed for pretty much all levels of practitioners. It gives the trainees some ideas how to create their own classes tailored to a specific group or private lesson. If you are struggling with forward bending poses because the backs of the legs are tight then you can use a couple of the ‘extra’ poses from this video to add to your daily yoga routine. They are not part of the Ashtanga system but they are useful to do either before you start practicing or in the evenings before going to bed. This sequence is useful for gaining strength in the core of the body (abdominals) as well as the upper back, shoulders and arms. All of which are beneficial in the development of your regular daily yoga practice. A challenging pose that requires a lot of flexibility all around the hips, legs and lower back! It can take years of patient practice to do the full pose but don’t despair because there is something for everyone to work on! The path is the goal. Here we give step-by-step preparations all the way up to the final position so that every individual can decide the most appropriate way to work in the direction of supta kurmasana. The headstand pose, Sirsasana in Sanskrit, is also described as the King of Asanas. And as such, it is important to give it the respect it deserves. It is a difficult pose that will literally put our head upside down, and that will change our perception of the world. It is also a pose that scares many people, rightly so because if it is not executed properly it can cause problems. In this video, we give you the basics to start while guiding you step by step towards achieving this delicate position. This is a pose that comes about half way through intermediate series. In this video Linda goes through it step-by-step in a way that gives everyone something to work on, even if you are not going into the full version. In fact, if you work this way, you will gain much more strength and stability in the arm balance than if you just fling yourself into it and hope for the best! Patience and perseverance are the keys. The following are four positions we find helpful to aid the yoga student in gaining flexibility and strength in the back, in addition to learning to lengthen the space between the vertebrae for a healthy spine. This is an advanced back bending pose from the intermediate series. In this video, Linda gives some tips on how to prepare your body for this intense position. Even if you are not working on Kapotasana the preparation exercises she goes through can be useful for other back bends where the arms go over the head, for instance Udhva Dhanurasana – Upward Facing Bow Pose. This is a short sequence to concentrate on elongating the spine and relaxing the back muscles after back bending. Long hours sitting at a computer, reading, driving, etc can bring tension in the shoulders, neck and face, in addition to weakening the back and abdominal muscles. The following routine is meant to release some of the tension in these areas while sitting in a chair… even while sitting in front of your computer! When you have the opportunity, it can be useful to also do the “Core Strengthening” and “Back Care” sequences to gain strength; making it easier to keep good posture while sitting. After all the strong work to strengthen body it is useful to spend a bit of time stretching out to help reduce the soreness in the muscles the next day. Here are a few quick poses to stretch out the quads, back and neck. A nice practice to relax the neck at the end of practice or even when the neck is sore from daily life! 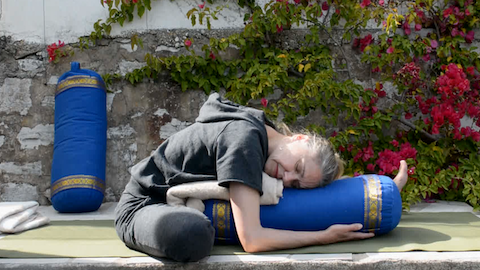 Restorative Yoga is about as opposite to Ashtanga as we can get. There are no standing poses, there is no flow and we hold the poses for a long time. But it is absolutely wonderful! Learning to relax and stay still is an integral part of yoga so taking the time to integrate a relaxing practice to your weekly program can be something totally refreshing. In this restorative practice the poses are targeted towards the hip area. It is a nice practice for a regular routine or for those wishing to relax the whole area around the hips. Following are 2 exercises that are called “kriyas” or purifying techniques: Uddiyana Bandha (full version) and Nauli. Done each morning before eating or drinking, they will improve your digestion and elimination.